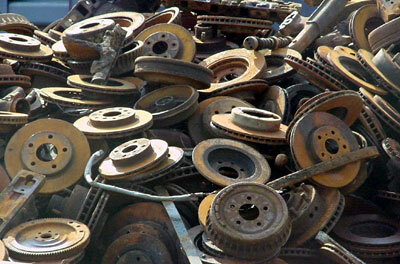 The general term “cast iron” include gray iron, ductile iron, chilled iron, white iron and malleable iron. All are high-carbon, high-silicon alloys, usually containing 1.7 to 4.5% carbon. Gray iron contains graphite in the form of flakes, which are dispersed in matrix that normally is pearlitic. The addition of approximately 15% nickel produces an autenitic matrix. Ductile iron, also known as nodular iron, is cast iron to which magnesium other elements that cause the graphite to form nodules (spherullites) have been added to the melt. Chilled iron is produced by casting gray or ductile iron against a metal or graphite chill, resulting in a surface zone (white layer) that is virtually free of graphitic carbon. White iron, which is virtually free of graphite throughout the casting is obtained by selecting the composition of the alloy so that graphitization will inhibited for the desired section size. Malleable iron is the result of annealing white iron castings of appropriate composition, to convert the carbon that is combined in the cementite (Fe3C) to elemental carbon (graphite) in the form of temper-carbon nodules.